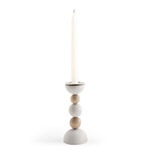 Add sophisticated Scandinavian charm to your home with this beautifully crafted wooden candlestick. 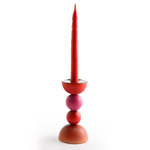 This striking mixed red wood candlestick is just one of the stylish home accessories by Aarikka that you can buy online from Arctic Fashion. Made from sustainable birch wood, this mixed red design is bright, eco-friendly and long lasting. It measures 16cm and makes a great Christmas purchase either for yourself or a friend or relative. The Helmi wooden candlestick will help create a warm and welcoming feel in your home this Christmas. Use it to light up your dining room table on its own or as part of your table centerpiece. With different mixed red beads, this candlestick will complement and also add an extra dimension to festive red colour schemes. Alternatively, give this candlestick as a Christmas gift to house proud friends, new homeowners or newlyweds. Beautifully designed by Aarikka and made from environmentally friendly materials, this is a useful and unique designer accessory to brighten their home for years to come. For more minimalist tastes, you can also purchase this chic candlestick in natural wood and white. You can also purchase it in a larger size - 19.5cm.